Early spring in the Brandywine Valley and the surrounding area is the ideal time to look and listen for herps. Amphibians must get to water to lay their eggs. Many of the earliest mating amphibians travel in large groups. For many of these species, there is urgency because their breeding grounds are vernal pools—ephemeral bodies of water that fill up in spring and dry out over the summer. Vernal pools are critical habitat because their short-lived existence prevents fish and other predators from establishing a population that would otherwise threaten the survival of the breeding amphibians. Reptiles differ from amphibians in that they have waterproof skin composed of scales, and lay hard-shelled eggs (or in a few cases, live young). Reptiles in our region include a variety of snakes and turtles; lizards may be observed in a few specific habitats. Some reptiles are adapted to live in or around water (such as the Northern watersnake, snapping turtle and painted turtle). All turtles, even aquatic species, dig nests on land in which they lay their eggs. While most species of snakes (such as the Eastern milksnake) lay eggs, the Common garter snake—which is very active in our region in early spring—gives birth to live young. Herps differ from birds and mammals in the way they regulate their body temperatures. Through a process called “ectothermy,” herps warm themselves by absorbing heat from their environment—such as basking in the sun, allowing the sun’s rays to penetrate their skin. Birds and mammals generate body heat through their metabolism, a process called “endothermy.” Often these terms are misleadingly referred to as “cold-blooded” and “warm-blooded.” Because herps need to absorb heat from their environment, the species have evolved to survive cold winters. Most enter dormancy or hibernate, slowing down their metabolic processes—some as much as 95% or more—so they need very little energy or oxygen. Beginning in the earliest days of spring, or late winter if it is a mild season, herps awaken from their winter snoozes. Spring is a time of frenzied activity. The main order of business is to mate and lay eggs. While typically secretive, many herps are active and out in the open during the spring, making it a great time to observe them. Even those that are harder to spot can still be heard, as they are also very vocal during this time of year. Below are different snapshots of commonly encountered early spring herps in our region. Wood frogs, gray treefrogs and spring peepers all shelter under leaf litter or tree bark. These frogs are amazingly tolerant of cold temperatures. In winter their cells are pumped full of glucose that acts as an anti-freeze; their metabolism nearly stops and they stay in a torpid state—virtually frozen—until spring when they thaw out and miraculously return to life. Wood frogs are the earliest of the region’s herps to emerge from their winter hideaways and begin the spring mating season—usually by early March. Wood frogs are abundant in our deciduous woodlands. Their striking facial coloration makes them look like they are wearing a mask, so they are easily identified. Their spring mating call is equally distinctive. Wood frogs have a rapid, duck-like quacking call [click here to listen!]. Wood frogs descend as a group onto their breeding pools and ponds. As long as the location remains undisturbed, the frogs will return year after year to the same location. Their mating season is short—no more than a week. For good reason, this phenomenon is termed “explosive breeding.” The males arrive first, wrestling each other for dominance. Having sorted things out, they call vociferously to attract arriving females. The females lay their fertilized eggs in communal masses of thousands of eggs. 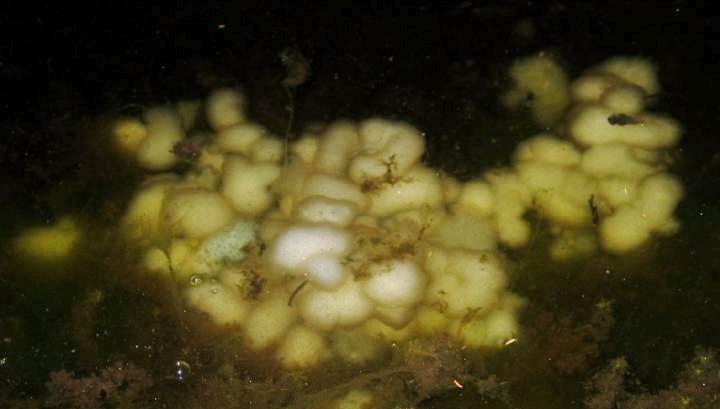 Look for theses masses of clear, jelly-like globules floating just below the surface of a pond (they may turn green as a harmless algae colonizes the egg masses). Wood frog eggs are adapted to withstand freezing temperatures that may occur while the embryo develops. Within six to eight weeks, the eggs hatch into tadpoles, who feed on aquatic plants as they turn into juvenile froglets over the next three months. The juveniles hop into the woods to begin life on land, returning to water only to breed. Gray tree frogs awaken from hibernation between April and June. They typically move to breeding pools during the summer, but their season lasts longer into August. In stark contrast to the wood frogs, gray tree frogs have more of a relaxed attitude towards mating. Spring peepers are certainly the most easily observed spring herps, but they are more often heard than seen. Tiny (1-inch-long) spring peepers spend most of the year in the woods. They can rapidly camouflage themselves, changing their coloration between brown and green to match their surroundings. In early spring, they move to water: swamps, marshes and ponds. On warm evenings, the males climb onto rocks, tussocks, sturdy stems and other dry spots; there they begin their eponymous peeping to attract a mate. The volume of “peeping” is all out of proportion to the frogs’ size. Spring peepers, like other members of the chorus frog genus, synchronize their vocalizations for reasons that researchers have yet to thoroughly understand. One “peep-peep-peep” is loud, but hundreds of “peeps” in chorus together are reverberatingly loud. After mating, individual females lay their eggs under submerged vegetation. The subsurface eggs are not easily observed. Females return to the woods while unmated males remain. The peepers’ mating season is not compressed, so we will hear the males calling well into late May or June. American toads are among our most commonly seen herps. As “habitat generalists,” they enjoy suburban yards, farm lands and deep woods. For most of the year they are primarily land-dwelling creatures, but without access to water for breeding the species cannot survive. The toad hibernates underground, burrowing into soil below the frost line. After digging out from its subsoil burrows in March or April, the toad finds its way to a ditch, pool or pond. A male will sit in shallow water where it emits a long ethereal trill [click here to listen!]. While toads do not purposely participate in chorusing behavior, other toads in the vicinity may call at the same time. It’s an arrestingly beautiful sound, and for those who consider toads “ugly,” it’s also a surprising revelation. Female toads swim around with the male, laying eggs as they are fertilized. The eggs hatch in a few days, and the tadpoles turn into toadlets within two months. The most common salamander in our region, the Eastern redback, is terrestrial: it lives in upland woodlands and can typically be found under rotting logs. But it is the aquatic spotted salamander that is of most excitement to spring herpers. Despite its striking appearance—black with bright yellow spots—the spotted salamander is infrequently observed in our area. Late winter/early spring is the best time to catch a glimpse of this species. It is a type of “mole salamander” that spends most of its life underground. Its preferred habitat is woodland with vernal pools. In March and early April, typically on a warm rainy night, the spotted salamander emerges from its burrow to make its way overland to nearby shallow water. These salamanders travel individually but congregate in groups upon arrival. Under cover of darkness, they mate along the shore of the pool. Females then lay eggs in communal masses. The eggs start out clear but often become cloudy. You may never spot the spotted salamander, but its cloudy egg masses are unmistakable. Of the reptiles common in our region, the painted turtle is most frequently seen—especially if you spend much time around lakes, ponds, open marshes or slow-moving streams. An aquatic species, the painted turtle hibernates while buried in the muddy bottom of a water body. It “breathes” through its skin, absorbing tiny amounts of oxygen from air trapped in the mud. In March or April, painted turtles emerge from hibernation. Because they typically forage underwater for fish and aquatic vegetation, they are most commonly observed when basking just out of the water—on logs or rocks—where they can easily slip back in if threatened. Painted turtles have dark shells with an outer margin of red and black. They mate and lay eggs in mid-spring. Though an aquatic species, their eggs are laid on land in nests that may be hundreds of feet from water. Females are at risk if they have to cross a road to get to their nest site, and their nests are frequently attacked by predators. Turtle hatchlings hibernate in the nest and don’t emerge until the following spring. None of these common herp species is federally or state-listed as threatened, endangered or vulnerable. However, their habitat is under increasing pressure in our region due to continued land development—leading to loss of woods, wetlands and vernal pools. They are also at risk from emerging parasites, fungi and disease, as well as indiscriminately applied pesticides and herbicides. Learn more about protecting herps and get involved! Find herp outings in your area, get involved in citizen science, and report PA sightings to PA Herp Survey (a Delaware version of this program is in the works). Use herp etiquette when looking for herps—so as not to jeopardize their health or safety—and comply with relevant state game regulations, such as limits on possessing herps. State game regulations can be found here for Pennsylvania and here for Delaware. Watch for herps crossing roads when driving on warm, rainy spring evenings if you are between woods and water. Protect woods and wetlands on your property. Minimize converting natural habitat to lawn and pavement. Practice “integrated pest management” to minimize collateral impact of pesticides and herbicides. Support regional land conservation organizations such as the Brandywine Conservancy.